The GayBarMaps website provides up-to-date information about gay bars, clubs, taverns, pubs and nightclubs. 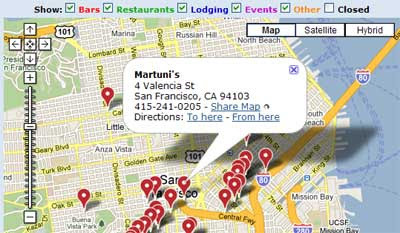 The site uses Google Maps to show the locations of all the bars in its database. The map for each location allows the user to select from a number of categories, Bars, Restaurants, Lodging, Events and Other. Clicking on a map marker reveals the name and address of the bar and a link to it's website. There is also the option to get driving directions.